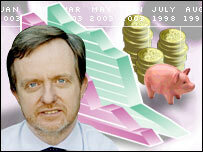 A financial expert attempts to predict the future for shares. First let's start with an admission. If I could tell you accurately how low or indeed how high the market could go I would probably not be writing this piece now. Instead I would be in New Zealand fishing for wild trout, having made my fortune in the futures market. After three years of falling markets, private investors are beginning to give up on the market. Sales of Individual Savings Accounts (ISAs) are plummeting and 2003 will be the worst year for the financial services community since 1988 (after the 1987 stock market crash). In addition, pension and insurance funds are still switching monies out of shares into bonds. Why should this matter? Put simply the stock market is like any other market. If there is a lack of demand, prices fall. In many respects this is what we are witnessing at present. Most of the selling has come from insurance funds. If the pension funds start selling in earnest then the UK market could fall significantly further. The recent closing level of 3,287 now looks like a great buying opportunity with the market having risen by more than 20% since then. This was mainly because the market priced in a short, sharp war in Iraq. A relief rally was always on the cards and this could easily propel the UK market back over 4,000. However the $64m question is whether the rally is sustainable. The war hopefully is a short-term problem but the economic problems globally won't disappear when they overthrow Saddam Hussein and afterwards the market is likely to return to these. Global economic woes centre around the profitability of companies. It is increasing company profits that propel share prices higher. Western companies face the serious test of globalisation - in truth China and India are fast becoming the world's manufacturing bases. In addition, the long bull market has led to overcapacity. Companies have over-invested, particularly in areas like telecoms and there simply is not enough demand. This in turn leads to falling prices. Ironically an economic recession - which perhaps we should have had in 1998-99 - although painful would have cleansed this overcapacity. Instead we are in a position of death by a thousand cuts. One other factor weighs on major stock markets, particularly in the US. Despite a three-year bear market share prices can not be said to be cheap. On average, the ratio of share prices to company earnings (P/E ratio) is at present 11.6 in the UK, compared with the long-term average since 1926 of roughly 12 - so hardly a fantastic bargain. In the US it is much worse with the P/E ratio nearer 27, against a long-term average of 17. At its lowest point so far, the market at 3,287 was some 53% down from its all time high. At these levels, it began to look interesting but the worst bear market of the last century was arguably that of 1973-74, which saw a fall of 73%. If this were to be repeated, the FTSE 100 would sink to 1,800. This would be a buying opportunity of a lifetime although there would be few to take it up. Be careful not to get sucked into a rally. Investments should be made gradually on the bad days. For the time being I believe the market is likely to be kept in a trading range of roughly between 3,600 and 4,000. So despite brief rallies and falls, I suspect the real buying opportunities will be not in the FTSE 100 but in the shares of medium and smaller companies. All I can really say for sure is that 2003 will continue to be a volatile year which means investors need to be brave, buying when the news is really bad. The views expressed are solely those of Mr Dampier and are for general information only, do not constitute financial advice as defined by the Financial Services Act and are not intended to be relied on for the purposes of making an investment decision. Always obtain independent advice from a qualified, registered financial advisor before making any investment decisions. Savers: Anywhere left to hide?